"Castle Peak" will be based on the upcoming Zen 2 core, while this year's Threadripper gen 2 will feature a slightly improved 12 nm Zen+ core. 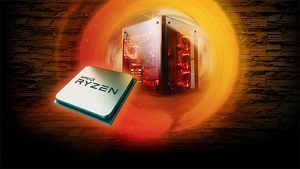 The first Zen 3 cores are expected to arrive with the 2020 APUs. AMD is known to be holding special events for retailers and distributors at least twice a year. According to Informatica Cero, the company presented a new roadmap slide at the latest special event, revealing more information about the upcoming CPU architectures and release schedules. The slide is not supposed to be public, but the guys over at Informatica Cero leaked it anyway. It presents an overview for each year up until 2020 and also introduces the idea of an “Inflection-Optimization” release schedule approach, with inflection years introducing new technologies and CPU cores, while optimization years are meant to further improve the architectures released the year before. It now makes sense to see that 2018 is considered an optimization year, as AMD is enhancing the original Zen architecture launched in 2017, which was an inflection year. The “Raven Ridge” APUs and “Pinnacle Ridge” desktops CPUs were already revealed to be launched this year, however, the leaked slide also mentions a “Threadripper” gen 2 for 2018, as part of the Zen+ improved architecture. This should be the 12 nm version of the Threadripper models launched last year. 2019 will be a new inflection year when AMD is to introduce the anticipated 7 nm Zen 2 core. From here onwards the desktop CPUs and APUs get codenames of well-known painters. There is the “Matisse” desktop series, the “Picasso” APU series, and the “Castle Peak” series which will include the Zen 2 variants of today’s Threadrippers. AMD is also expected to launch its EPYC server CPUs codenamed “Rome” and “Starship” in 2019. As an optimization year, 2020 will only enhance the previous Zen 2 architecture. 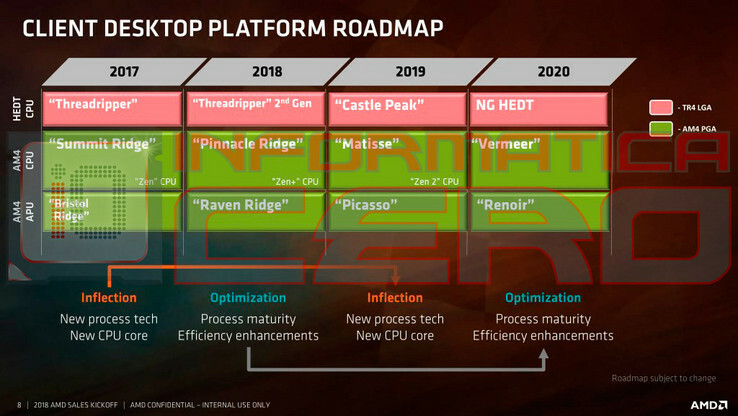 The desktop CPUs for 2020 are codenamed “Vermeer, while the Threadripper successors are just known as next gen HEDT (high-end desktop). However, according to Videocardz, the APUs codenamed “Renoir” are said to be featuring the Zen 3 core that will be introduced in 2021 for desktops and HEDT. It is not clear what manufacturing process all these models will feature, but previous slides indicate that AMD will stick to 7 nm through 2021 as well.